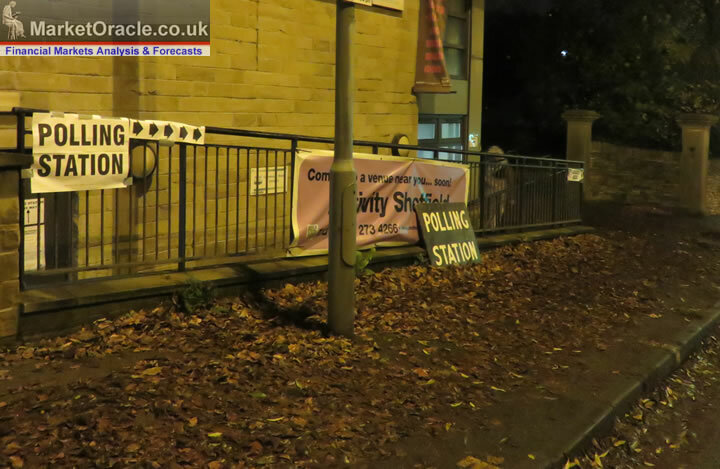 Over 50,000 polling stations are open today across the UK to cope with the expected demand from an estimated 32 million voters out of a total of approx 47 million eligible to vote. With all eyes turned to the next big event of the election, the EXIT POLL to follow within minutes of the polls closing at 10pm. Which unlike the multitudes of daily opinion polls that have hardly budged for the past 2 months, the exit poll should provide an accurate gauge of what is the probable outcome of the general election some 10 hours before enough seats have been counted to make the actual result clear. Therefore the exit polls have proved very accurate for the past 3 general elections in determining the outcome in terms of which major party would form the next government, also proving for more accurate than the opinion pollster forecasts such as that of the US election forecasting guru Nate Silver who got the 2010 UK general election badly wrong which I recently covered here - Nate Silver UK General Election Forecast 2015 as Wrong as 2010?. Though of course this time the exit poll academics could yet get it wrong. Here is the last seat forecast update from the main opinion pollster analysts as we count down to the 10pm exit poll. 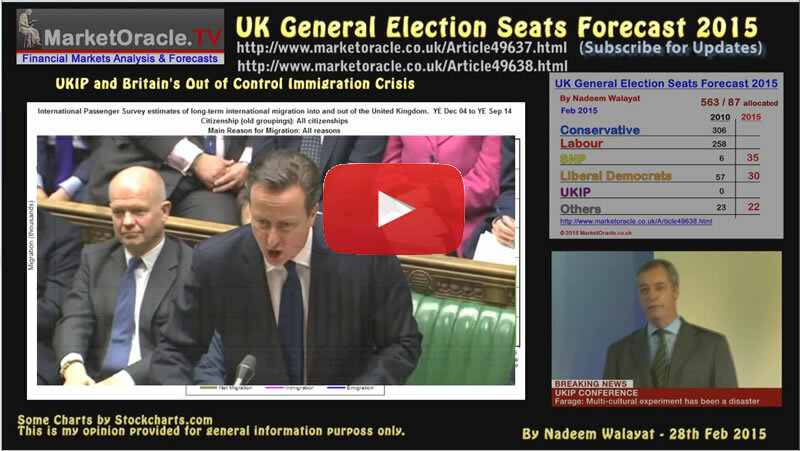 28 Feb 2015 - UK General Election 2015 Seats Forecast - Who Will Win? Therefore the most probable outcome is for a continuation of the ConDem Coalition government on 326 seats (296+30) where any shortfall would likely find support from the DUP's 8 seats. The alternative is for a truly messy Lab-Lib SNP supported chaotic government on 327 seats (262+30+35) which in my opinion would be a truly disastrous outcome for Britain, nearly as bad as if Scotland had voted for independence last September. 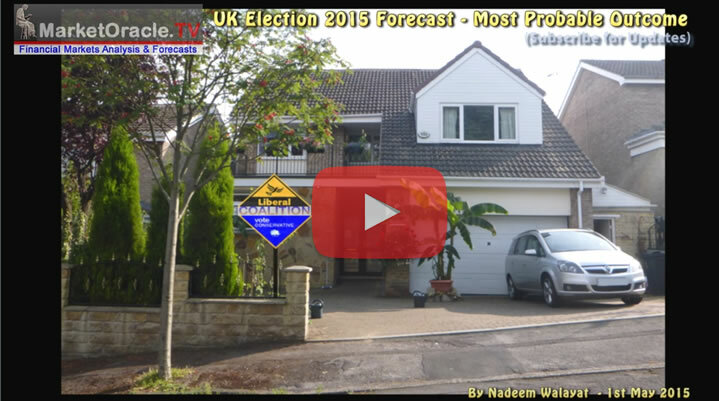 Another possibility is that should the Conservatives do better than forecast i.e. secure over 300 seats but still fail to win an overall majority, then they may chose to go it alone with the plan to work towards winning a May 2016 general election. The bottom line is that the opinion polls do not reflect how people will actually vote on May 7th when they are faced with a stark choice of steady as she goes ConDem government or take a huge gamble on Ed Milliband's Labour party. So in my opinion several millions of voters will chose to play it safe with ConDem which thus is the most probable outcome. The bottom line is that in my opinion a continuation of the Coalition government is the most probable outcome which means a combined total of at least 323 seats. Therefore come May 8th virtually all pollsters will have egg on their faces as the mainstream media will have flushed untold millions down the drain on commissioning opinion polls that turned out to be WRONG just as the polls were wrong in the run up to the Scottish referendum that was never a 50/50 proposition which at the time I concluded was mainly so as to allow pollsters to sell opinion polls and the mainstream press to sell copy and so it has been for the 2015 election campaign. UK Saved From I.S. Threat But Scottish Independence Nightmare is Not Over! There is another reason as well for why the polls were so close and that is one of SALES, the polling industry SELLING a tight election so that the gullible mainstream press would buy their polling services. Therefore painting a picture of a tight race by manipulating the data will have turned out to be a huge money spinner for the polling agencies. My article concluded in the most probable forecast for the outcome of the result would be for at least show a 10% gap between NO and YES, and definitely not reflective of the mass hysteria. Ensure you are subscribed to my always free newsletter for continuing in-depth analysis and concluding trend forecasts.